Seattle Photographer Al Smith, Sr. In the article below, Al “Butch” Smith Jr., PhD, and Peter Blecha describe the process by which the family of prominent Seattle photographer Al Smith Sr. chose the institution to permanently house the ten-thousand- image Smith collection. The process they developed and followed could be a model for other families deciding how to handle the personal records and memorabilia of deceased relatives. In spring 2014, the Al Smith family in Seattle, Washington, donated the complete photo collection of Al Smith Sr. to a well-regarded local institution. Since another prominent public institution also sought this donation, in order to enhance fairness in decision-making, we decided to develop a vetting process and asked each institution to participate by responding to twenty questions that the family wanted clearly answered by both institutions in order to make a well-thought-through decision about the donation. Al Smith Sr. (1916–2008) was born in Seattle to Jamaican immigrant parents and grew up in the heart of the Central District, the city’s historic African American community. Smith was the first African American to attend O’Dea High School, the largest Catholic school in the region. After graduation, he worked as a train porter and merchant marine sailor aboard ships that regularly traveled to Japan, China, and the Philippines. Smith developed an early interest in photography, and after first experimenting with a simple Kodak Brownie camera that he’d gotten at age twelve, he acquired a superior Swiss-made Icoflex camera during one of his trips to Japan. In 1942 Smith married Isabelle Donaldson, whose local roots date back to the 1890s coal-mining days in Roslyn, Washington, where her family first settled after fleeing Jim Crow practices and violence in the post-Civil War Deep South. Thus, the Smith/Donaldson family is today one of Seattle’s oldest and most accomplished pioneering black families. Meanwhile Smith, by now a self-taught photographer, picked up a professional-quality Speed Graphic camera along with tips from friendly photographers. Today the high quality of his work is self-evident. Smith eventually began a side business, On the Spot, a service whereby he would snap photos of patrons and entertainers at various local nightclubs and theaters, and then, within days, would mail them a print. This is why Smith’s archive, which numbers over ten thousand items, contains images of prominent touring musicians and entertainers such as Louis Armstrong, Cab Calloway, Fats Waller, Jimmie Lunceford, Kathryn Dunham, Lionel Hampton, Duke Ellington, Count Basie, Tommy Dorsey, Harry James, Woody Herman, Hazel Scott, Paul Robeson, and the Mills Brothers. Smith was also fortunate enough to take photos of the famed vaudevillian clown Emmett Kelly and a young, relatively unknown boxer named Joe Louis. During the 1970s, Smith served as the official photographer of the World Champion Seattle Super Sonics basketball team. Luckily, for posterity, Smith cultivated a habit early on of taking one of his prized cameras almost everywhere he went. And, he went everywhere it seems: to parades and festivals, to circuses and boxing matches, to dances and concerts, to schools and churches, to high school sports events, to weddings and funerals. The result: Smith captured what might be considered as the most significant photographic representation of Seattle’s twentieth century African American community. Beyond his immediate neighborhood, Smith also had a keen curiosity about his hometown, its people, and the wide range of their social and cultural activities. His images documented Seattle’s Chinese, Japanese, and Caucasian communities. Thus, his archive contains a historically unique and visually compelling documentary record of life in twentieth-century Seattle that simply doesn’t exist anywhere else. People viewing his photos will experience the Northwest’s cultural evolution from the 1930s Great Depression, through the World War II years and into the Civil Rights Era of the 1960s, and finally into the 1970s, all through Smith’s artistic eyes and the lenses of his professional camera. 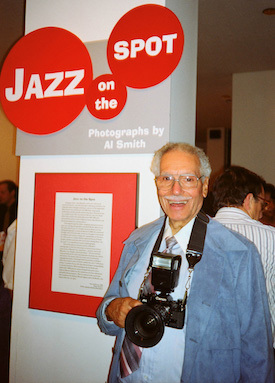 Over the years, small portions of Smith’s photographic artistry have been honored by being exhibited in venues, including Seattle’s Museum of History and Industry (MOHAI), the Northwest African-American Museum (NAAM), the Paramount Theatre, the Wing Luke Museum, and the Experience Music Project (EMP). The vast majority of Smith’s images, however, have never been seen by the public, and a major goal of the family is to have a traveling exhibit that would display portions of his work. Similarly, several books and newspaper features over the past two decades have reprinted selected images from his personal archive. (1) Will our family be able to visit any time and access the entire collection of negatives, slides, and prints, and also have photo prints made for our discretionary use? (2) Will the general public and/or select individuals or groups have access to this collection for resale or commercial ventures? (3) How long will it take to process this collection, i.e., inventory and proper storage of all prints, negatives, slides, and related artifacts? How would these activities be financed? How soon might financing be available? What would be a reasonable target window to accomplish all of this? (4) How soon can we expect to see components of the collection online for public access? What does public access imply? Will people be able to download “quality prints” at their discretion? (5) Will your institution be allowed to sell or loan out any of our father’s images at its discretion without the permission of the family? (6) What if the family decides it wants twenty 12”x18″ prints of photos for its discretionary use? Would that be possible? How often could this be done? (7) Would your institution be open to taking a lead role with the family to consummate an inter-institutional agreement between the family and other local museums to collaboratively sponsor, promote, and facilitate a series of exhibitions of selected subsets of the Smith photos? (8) How soon would your institution be able/ready to mount a substantial exhibit of this photography, either on its own or in collaboration with other institutions? (9) Would your institution be amenable to Smith family members occasionally visiting the collection on site and helping with the sorting and organizing of the work? (10) Will your institution make any money from the sale or use of prints? (11) How soon would the entire collection be assembled and deposited at your institution? (12) How would your institution prevent any resale of prints it has sold or otherwise made available to the public or to other institutions? (13) What copyrights are retained by the family? (14) How soon do you estimate that your institution would be able to secure grants or other funding needed to begin organizing and preserving the work? (15) What will your institution do to guarantee the long-term physical preservation of the photographs??? (16)What does your institution do for production of high-quality copies for public access and exhibition use? (17) Can your institution offer exhibit spaces to show the photographs and present exciting programs based on exhibits? 18) Does your institution have a history of producing books and catalogs for exhibits? (19) Is your institution accredited? (20) Does your institution offer some negotiable flexibility in its Deed of Gift, the legal document that governs donations to the museum and library collections? We then sent each institution a cover letter explaining how and why these twenty questions were developed, and asked institutional representatives to respond to each question and to return their responses in a timely manner. We made appointments to visit each institution and tour their respective facilities. We visited both institutions within a two-week time frame. Upon receipt of responses to the vetting questions, the Al Smith family read responses from each institution and separately rated each response on the rating scale. We then sent each institutional representative a personalized letter notifying that person of our decision while briefly explaining the process we used to arrive at it. We then thanked them both for participating. The complete photo collection consisting of forty-seven banker boxes full of photo prints, negatives, and slides along with assorted photo albums and all of his cameras and related gear are now housed at Institution Y. The Black Heritage Society of Washington State is now collaborating with Institution Y and the Smith family to inventory and catalog the entire collection. A series of twenty-five oral history interviews with Seattle Central District community residents familiar with Al Smith Sr. and his photography is now underway, and a major exhibit of the collection is tentatively scheduled for winter-spring 2017. Quintard Taylor, The Forging of a Black Community: Seattle’s Central District from 1870 through the Civil Rights Era (Seattle: University of Washington Press, 1994); Ross J. Kelbaugh, Introduction to African American Photographs: 1850-1950, Identification, Research, Care & Collecting (Gettysburg, Pennsylvania: Thomas Publications, 2005). Collecting (Gettysburg, Pennsylvania: Thomas Publications, 2005).